Medical professionals and dentists are becoming increasingly aware of problems arising from sleep disorders. Conditions such as sleep apnea, snoring, and restless leg syndrome, can have major consequences both on your oral and overall health. Some of the ill effects of these disorders are changes in mood, energy, hormones levels, weight, sleep quality, and overall general well-being. Dentists like Dr. Lamberton, who have had extra training in this area, are skilled at identifying the oral symptoms associated with these disorders, and are often able to co-treat these disorders along with your physician. Dr. Lamberton may refer patients for a sleep study where indicated and is able to fabricate dental appliances that can help ease the symptoms of sleep disorders. There are many types of oral appliances now available which can help with sleep apnea and/or snoring. In many cases when a sleep disorder is suspected, Dr. Lamberton may send you to a specialist for a sleep study. If a condition such as sleep apnea is diagnosed, Dr. Lamberton will work with your physician to determine if an oral appliance is indicated in conjunction with or instead of a C-Pap machine. For some patients, an oral appliance is a more realistic, comfortable alternative to traditional treatments, and is often covered by medical insurance. 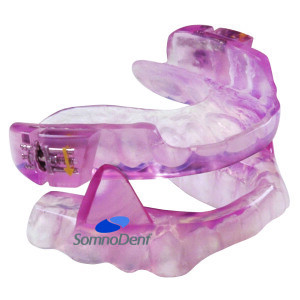 Like mouth guards, these devices are custom created by Dr. Lamberton and a dental lab to fit each individual patient.